The Abbey Road album will be performed in its entirety, with meticulous, faithful re-creations of the original arrangements. The audacious Tributosaurus Beatles Project, to perform all of their recorded songs from chronological start to finish, is nearing The End. On the heels of a triumphant performance of the White Album in its entirety, Tributosaurus attacks Abbey Road. Re-creating the rock, blues, pop, and prog nuances, with all necessary instruments, will be thrillingly difficult. The delicate brilliance of George Harrison’s “Something” and “Here Comes The Sun.” The progressively bizarre fuzz of “She’s So Heavy.” The iconic side 2 “Medley,” with 8 songs in 16 perfect minutes. As always, Tributosaurus will somehow bring music built on studio wizardry to a live performance. The centerpiece of the night will be the 11th studio album, considered by many to be the Beatles’ best. Ed Ward of Rolling Stone said Abbey Road featured a “sound that could not possibly exist outside a studio.” Well, we’ll see. Come join us for Abbey Road on April 25th at the Copernicus Center. 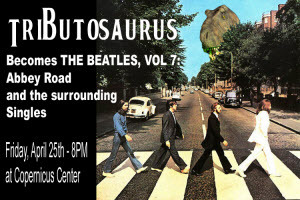 The Tributosaurus Beatles Project returns to the perfect place. The Copernicus Center’s theater was the first movie palace in Chicago designed for talking pictures, and it has been restored to its’ original condition and outfitted for live performance. It is incredibly convenient – located just a block from the Kennedy on Lawrence, and 2 blocks from Metra and Blue Line stops at Jefferson Park Terminal. From the starry sky ceiling to the marble clad lobbies, everything about this theater impresses, and the acoustics are fantastic too. Tickets are available here, as well as Tributosaurus.com and WXRT.com. Tickets are ONLY available online. The seating is assigned, so you’ll want to get yours ordered as soon as you can to reserve the section you want – and bring your kids to experience this – it is an ALL AGES show. The Betty Hemmert fund, in conjunction with Rock For Kids, helps young people pursue their interest in music. Betty, a music educator for almost seventy years, spent her life devoted to providing her students with skills and sensibilities that she highly valued. Chicagoans, of course, are most familiar with her daughter, Terri, the celebrated and much beloved WXRT DJ, whose commitment to her community is a matter of record. Many members of Tributosaurus are music educators themselves, and/or the children of music educators, so the fund named for Terri’s late mother and teacher is something that hits very close to home.